Mitochondria convert the energy stored in carbohydrate and fat into ATP molecules that power enzymatic reactions within cells, and this process influences cellular calcium signals in several ways. By providing ATP to calcium pumps at the plasma and intracellular membranes, mitochondria power the calcium gradients that drive the release of Ca2+ from stores and the entry of Ca2+ across plasma membrane channels. By taking up and subsequently releasing calcium ions, mitochondria determine the spatiotemporal profile of cellular Ca2+ signals and the activity of Ca2+-regulated proteins, including Ca2+ entry channels that are themselves part of the Ca2+ circuitry. Ca2+ elevations in the mitochondrial matrix, in turn, activate Ca2+-dependent enzymes that boost the respiratory chain, increasing the ability of mitochondria to buffer calcium ions. Mitochondria are able to encode and decode Ca2+ signals because the respiratory chain generates an electrochemical gradient for protons across the inner mitochondrial membrane. This proton motive force (Δp) drives the activity of the ATP synthase and has both an electrical component, the mitochondrial membrane potential (ΔΨ m ), and a chemical component, the mitochondrial proton gradient (ΔpH m ). ΔΨ m contributes about 190 mV to Δp and drives the entry of Ca2+ across a recently identified Ca2+-selective channel known as the mitochondrial Ca2+ uniporter. 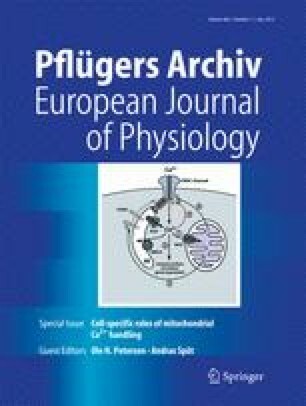 ΔpH m contributes ~30 mV to Δp and is usually ignored or considered a minor component of mitochondria respiratory state. However, the mitochondrial proton gradient is an essential component of the chemiosmotic theory formulated by Peter Mitchell in 1961 as ΔpH m sustains the entry of substrates and metabolites required for the activity of the respiratory chain and drives the activity of electroneutral ion exchangers that allow mitochondria to maintain their osmolarity and volume. In this review, we summarize the mechanisms that regulate the mitochondrial proton gradient and discuss how thermodynamic concepts derived from measurements in purified mitochondria can be reconciled with our recent findings that mitochondria have high proton permeability in situ and that ΔpH m decreases during mitochondrial Ca2+ elevations.